Picking out the right laptop at the right price becomes a bit of a hassle as prices range drastically without really offering enough value. 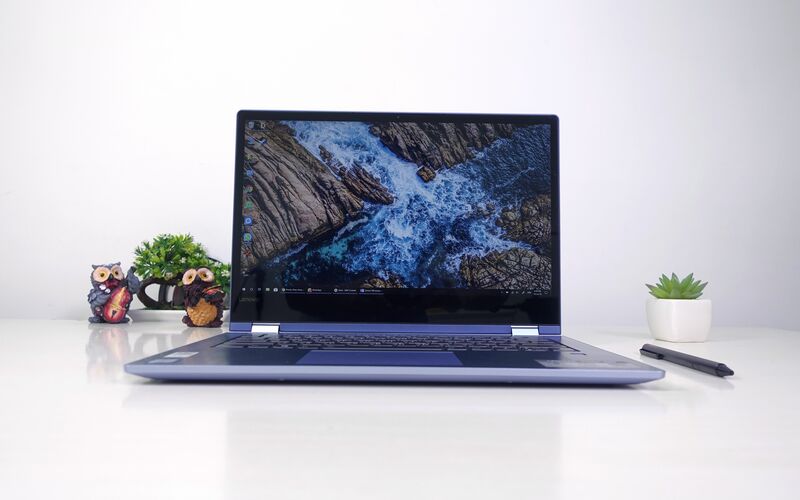 While most manufacturers tend to complicate this further by offering too many models, Lenovo tends to keep things relatively simpler with its range of both budget and premium laptops. 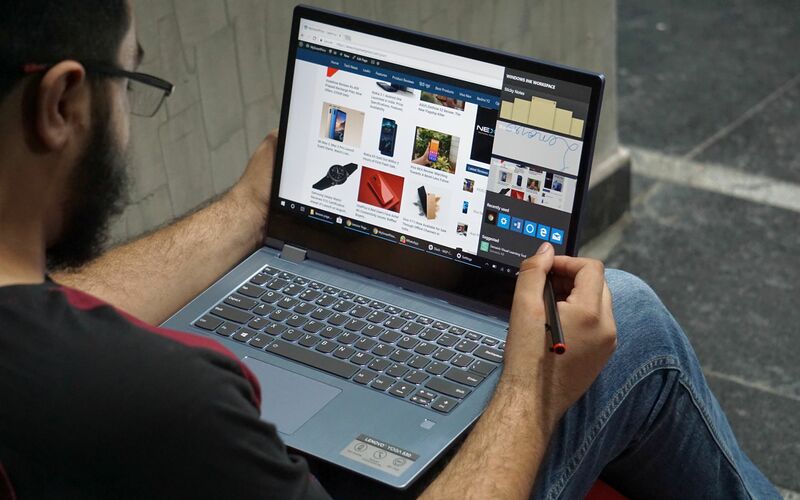 The 2-in-1 Yoga 530 seems to fall in the mid-range category and claims to offer an exciting package at a relatively affordable price tag. While there are a few different configurations you can go for, let’s take a look at the exact setup that we shall be reviewing today. 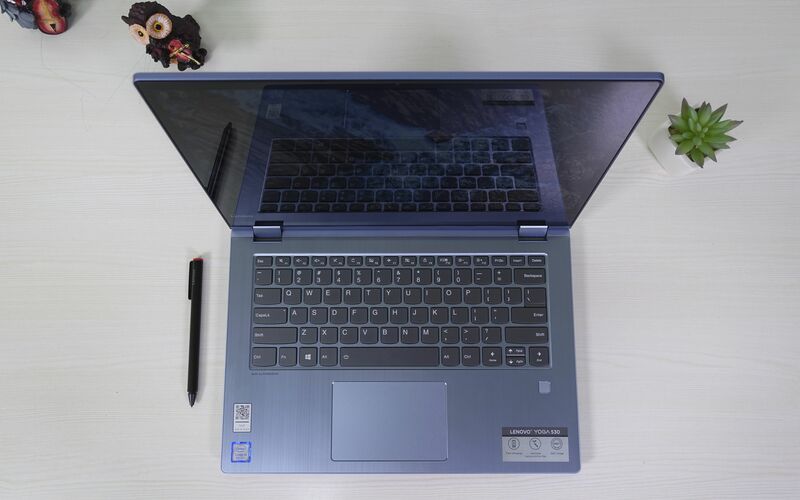 At the time of writing, there is only one sized model of the Yoga 530 in India which offers a 14-inch display. Ours comes with a 1920 x 1080 resolution IPS touchscreen. Pretty much all Yoga models come with a stylus included in the box. Coming to the internals, we are looking at an 8th Gen Intel Core i5-8250U processor paired with 8GB of DDR4 memory. As for the GPU, our model sports Intel UHD Graphics 620, but it is possible to get one with an Nvidia GeForce MX130 2GB graphics for a bit more cash. Completing our package is a 256GB PCIe NVMe SSD for storage. Our exact setup brings the price to Rs.69,999, while the setup with Nvidia graphics and a higher 512GB SSD goes for Rs.79,999 on Lenovo India’s online store. 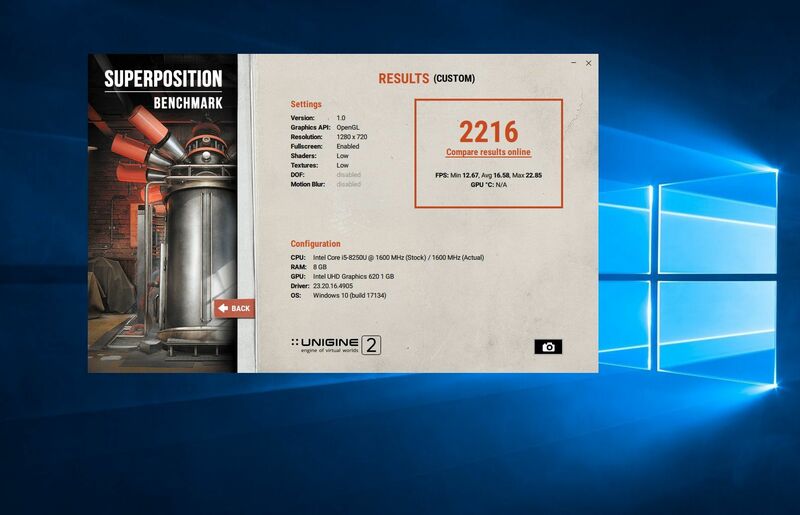 Also note that all of our testing and benchmarks were recording after updating the laptop to Windows 10 version 1803. Now that we have the specs and pricing out of the way, let’s find out whether or not this laptop is worth the investment. 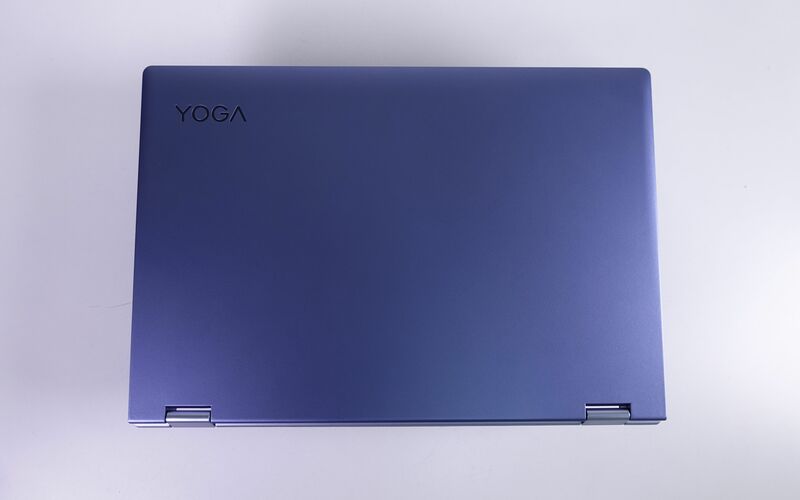 The exterior of the Yoga 530 is comprised of a textured but sturdy-feeling plastic. 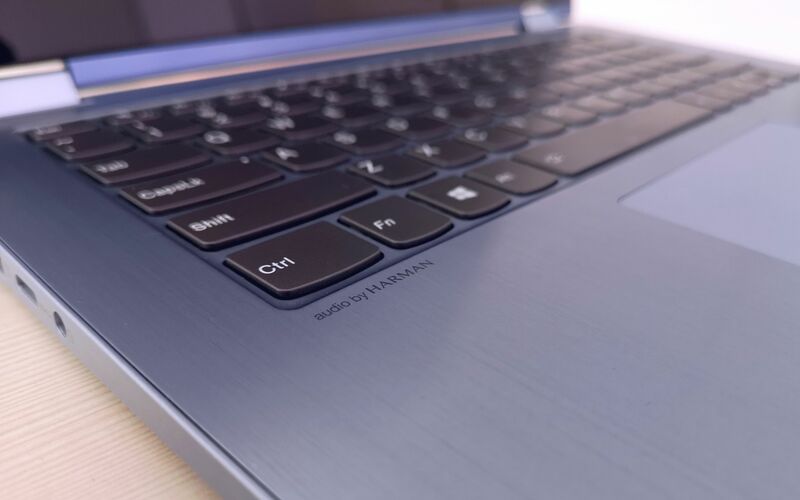 On the other hand, the keyboard area is constructed using a sheet of premium brushed aluminium. While there are two primary options to choose from (Onyx Black and Mineral Grey), we ended up with the dual shade “Liquid Blue” colour model which almost has a lavender hue depending on how the light falls on it. Looking around the outside, our model came with two USB 3.0 ports (one on each side), one USB Type-C port, one HDMI port, a 4-in-1 card reader, and an audio/mic 3.5mm jack. A power button and Kensington lock can be found on the right side while a circular charging port is on the left. This power button has a built in blue LED which turns red when the battery is low. 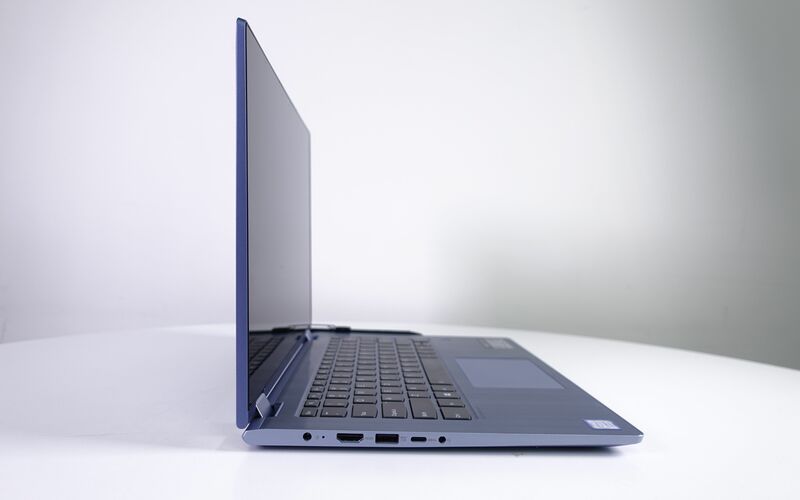 When closed, the laptop stands roughly 17.6 mm high and weighs in at 1.6kg. 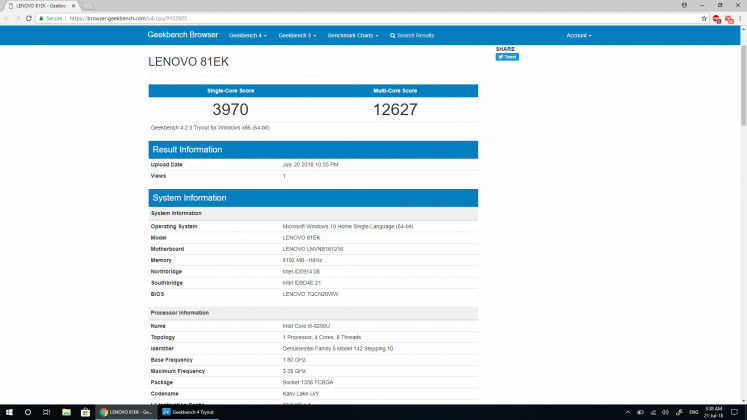 The overall design of the laptop hasn’t really changed compared to its previous generation model from last year, but Lenovo does seem to have addressed some issues customers had with it. 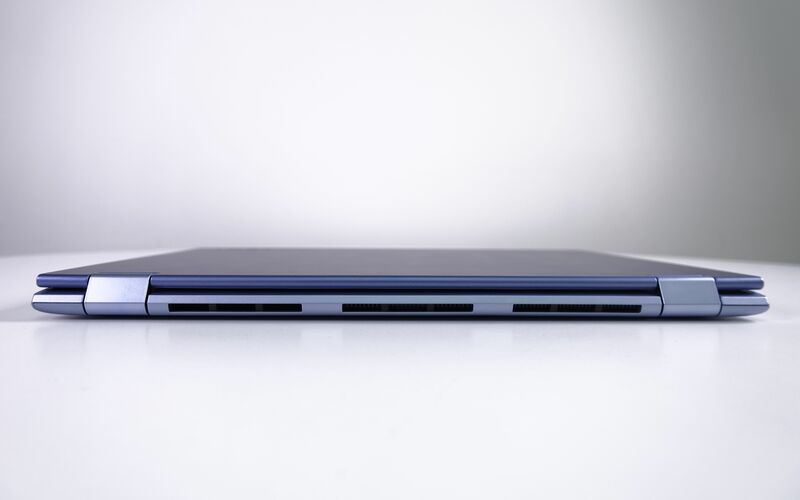 Users had complained that the Yoga 520’s hinge was too loose and that it would flop around sometimes. The only time something like this happened to me with the 530 was when I jerked it around with unreasonable force. In fact, the screen is so sturdy now that when the laptop is placed flat on a table, it is impossible to lift the screen with just one hand. This is a minor gripe which is difficult to complain about given the nature of convertibles. As such, there is also some screen wobble which is again something that I came to terms with given the flexibility and functionality it provides. 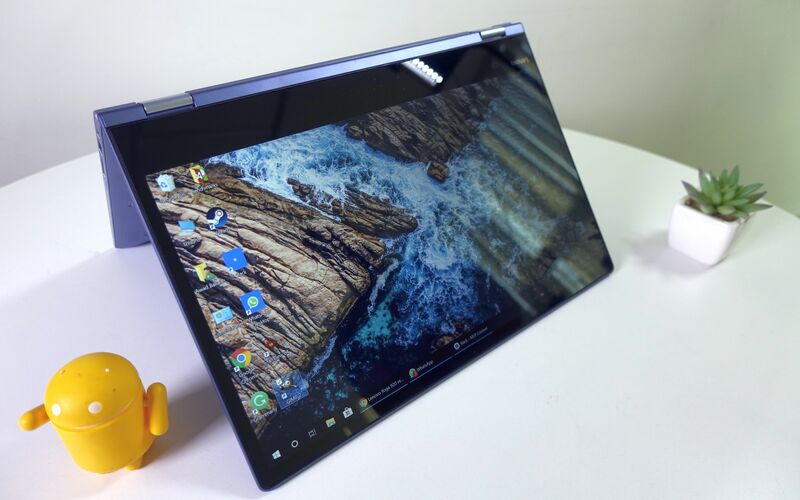 With all that said, there is one significant design aspect Lenovo still seems to be struggling with in its Yoga lineup – the placement of the stylus. 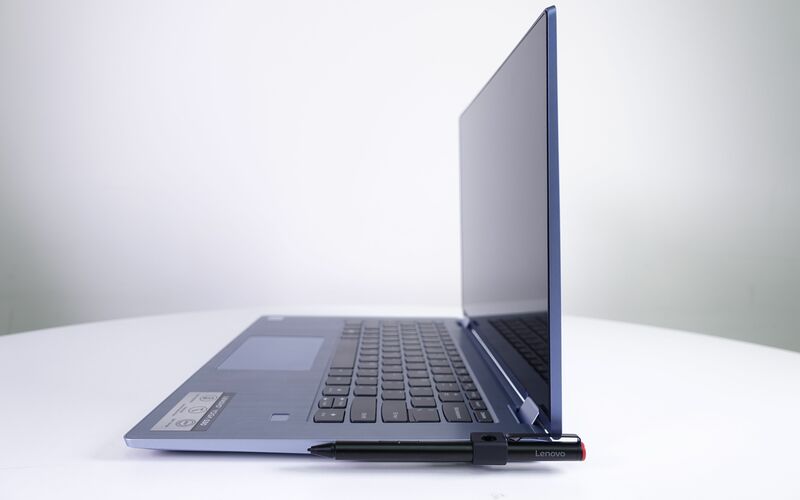 On the 530, Lenovo provides a small plastic holder for the stylus that plugs into one of the USB-A ports. While many other touchscreen notebooks opt for something magnetic, Lenovo’s rudimentary solution is an eyesore. I also did not like the proposition of having to jam a piece of plastic in the USB port and chose to just leave it off for the majority of my time with the laptop. In the end, I was impressed at how rigid and sturdy the laptop feels in daily use. 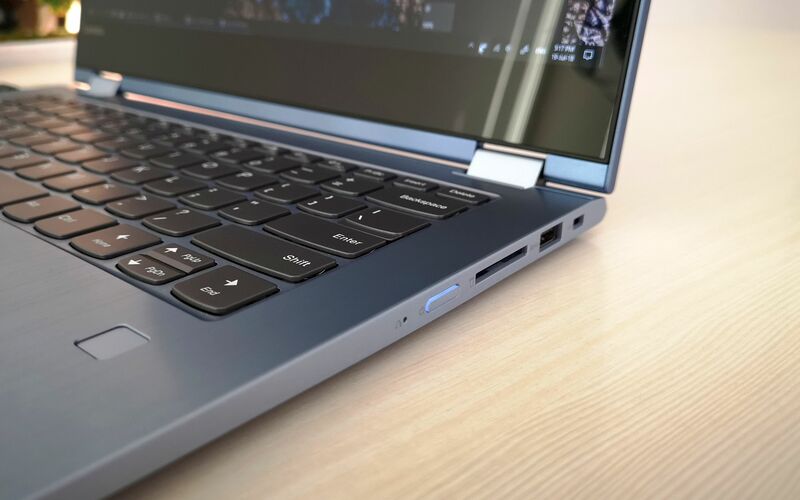 There is no denying that the weight and width of this laptop make it a bit harder to use in tablet mode, but you end up getting all the ports you could possibly need without having to deal with the ‘dongle life’ the Yoga 700 and 900 series enforce. Also, thin and lights at this price point are not nearly as powerful as the Yoga with its 8th Gen Intel Core CPU. This laptop offers enough incentive with its ports and performance that the slight heft is something I am comfortable living with. The only aspect left for Lenovo to figure out is the stylus placement. The Yoga 530 offers a 14-inch IPS display with a Full HD, 1920 x 1080 pixels resolution which was a pleasure to use. The colours were vibrant and the details were sharp. Regular use such as browsing and watching videos was enjoyable. The touchscreen was also remarkably accurate. Furthermore, the included stylus pen was a great addition and makes it a convenient accessory to have. The laptop recommends a default magnification of 150% that works well for tablet mode, but was a bit too much for regular laptop use. I ended up turning the magnification down to 100% and the touch was still respectably accurate in both tablet and regular modes. However, there were a few disappointing issues with the laptop’s screen. The glass over the display itself is quite reflective, while ironically being a total fingerprint magnet. Furthermore, the display brightness proved challenging in bright conditions. No problems when looking at the screen dead straight, but looking at it from an angle in a bright studio or outdoor lighting becomes impossible after a certain point. But the most annoying part of this screen is the unusually large bezel at the bottom. This design choice has been present in other Yoga notebooks up to this point as well, and I’m not a fan. Unlike the Dell XPS which houses the webcam underneath the display, the Yoga 530’s bottom chin is just a large black bar which is a bit unsettling. Some might argue that the space is present to give you something to hold on to in tablet mode, but I still feel its too large. I found the Yoga 530’s keyboard wonderful to type with. The chicklet keys have good travel with decent tactile feedback. This entire review was written on this keyboard and not once did it feel mushy. The individual keys are spaced far enough to not cause any miss clicks. Furthermore, a handy row of function keys adorns the top row. Other than the standard multimedia shortcuts, you get dedicated keys to lock the pc, disable the touchpad, and even physically disable the webcam. Finally, the entire keyboard is individually backlit. There is only one colour (bluish-white), and you can press the “FN” button and spacebar to cycle through three brightness levels – off, dim and bright. There is no auto-brightness feature, unfortunately, but this wasn’t a major concern for me. The large touchpad underneath the keyboard was another satisfying component to use. The fingerprint scanner and the touchpad stand out as they share the same shade of colour and are slightly recessed within the aluminium panel. Other than the very top, most of the entire touchpad can be clicked with satisfying feedback. The majority of this clickable part works as the left click, while only the bottom right corner works as the right click. Moreover, this is a Windows Precision-capable touchpad which means you don’t have to click at all and can just navigate using a series of intuitive taps and gesture. Learning the commands is easy and becomes second-nature in no time. The inclusion of a fingerprint scanner that works with Windows Hello is a great addition on this laptop. For me, it was more about the convenience than the actual security it is meant to provide. While not entirely a grievance, it is worth mentioning that this scanner might not function the same way as a smartphone scanner might. It is marginally slower and oddly specific. Let’s just say this scanner is a lot less forgiving to awkward finger placements than standard smartphone scanners. The audio on the Yoga 530 was acceptable in my opinion. There is a dual speaker setup here courtesy of Harmon. The laptop also comes with Dolby Audio preinstalled. However, the positioning of the speakers was a bit of a concern. The two units are placed at the bottom corners of the back panel. While this might help when using in tent or tablet mode, the regular laptop mode does exhibit some audio suppression based on the surface it is placed on. Someplace like a bed mattress will present a challenge while wooden and glass tables work much better. The real use of Dolby, however, comes when using a good pair of headphones rather than on the loudspeakers. There isn’t a lot to say about the webcam as it is a fairly standard camera. It can record up to HD 720p res videos. Lenovo has included an LED light just beside the camera which lets you know when it is turned on. This is a great feature that can help safeguard your privacy in case the laptop is compromised. This coupled with the previously mentioned function button to physically disable the camera adds a reassuring layer of security. The 8th Gen Intel Core i5-8250U is a major upgrade over its previous generation counterpart. This is a 4 core 8 thread CPU with a base clock of 1.60GHz which is claimed to Turbo Boost up to 3.40 GHz. 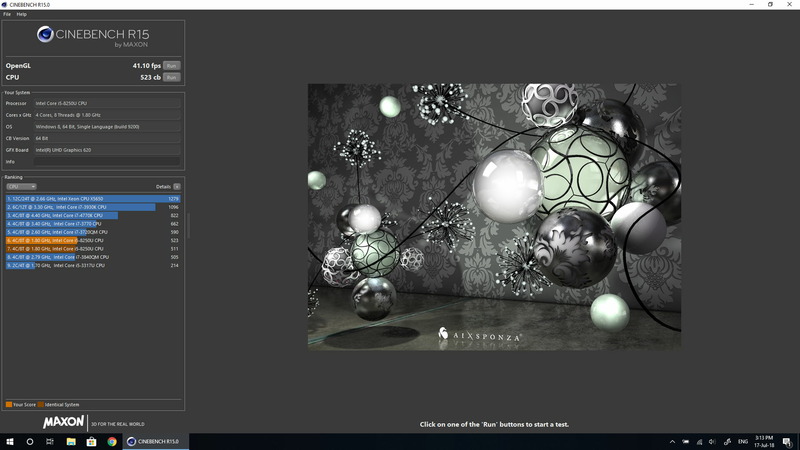 In synthetic benchmarks, I easily obtained maximum boost speeds of 3.38GHz without any thermal throttling. There were moments where the CPU temp would spike up to 80 degrees Celsius at the beginning, but it would quickly come back and stabilise in the 60 to 70-degree range. Pretty much all the benchmark results showcase impressive scores. But these numbers aside, the actual day to day use of this laptop was phenomenal. Real-world transfer speeds using the USB ports were lightning fast. 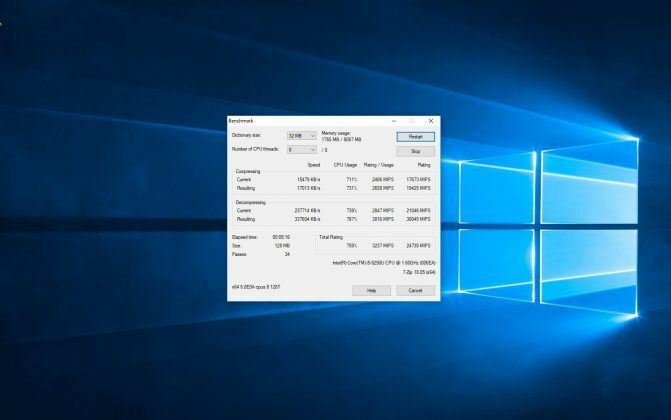 So were the startup and load times for Windows and any application you can throw at it. Actual startup from the moment I press the power button takes mere seconds. 8GB of DDR4 memory is also sufficient for most workloads. 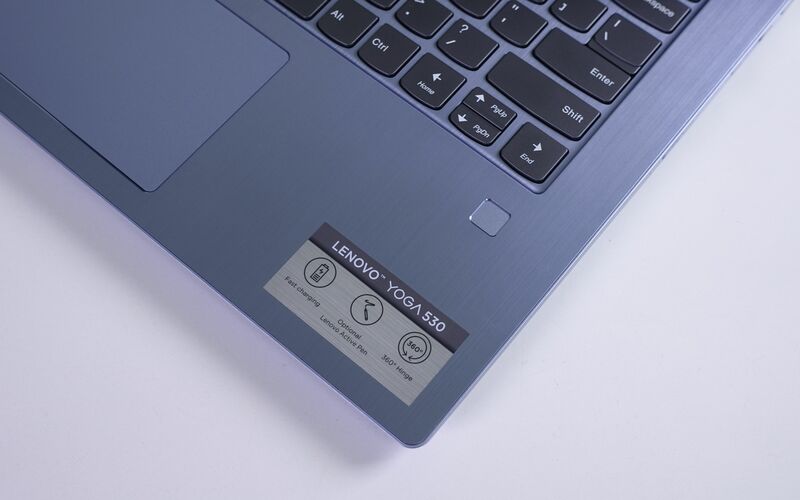 If you are into extreme multitasking, however, keep in mind that all Yoga 530 variants listed on Lenovo India’s web store only come with one RAM slot that houses an 8GB stick. With that said, replacing this stick should not be much of an issue for someone with the right tools and expertise. Understandably, the GPU is the main aspect which is lacking here but you can easily go for the higher priced version if your use cases absolutely require one. This could have been solved another way if the included USB Type-C port supported Thunderbolt technology, but it sadly does not. For everything else, the standard Yoga 530 variant does not disappoint. It was difficult to complain about the Yoga 530’s battery life as it lasted well enough. 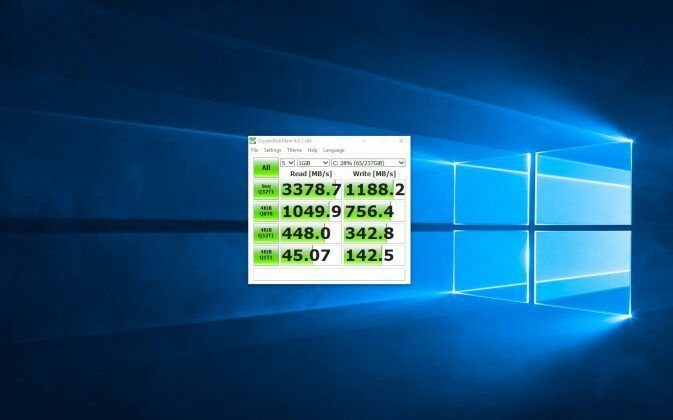 Windows 10 gives you control over battery life relative to performance. In ‘best performance’ mode with display brightness cranked to the max, our continuous video playback test gave us 6 hours of screen-on time. Switching to ‘best battery-life’ mode pushed that number by a full hour. While a 6 to 7-hour battery-life might not sound too impressive, it isn’t a total disappointment either. From its vibrant display to its excellent performance and beautiful design, there is a lot to admire about the Yoga 530. At a starting price of Rs.69,999, this 2-in-1 offers tremendous value for all that it offers. You get all the necessary ports and top-of-the-line internals neatly packaged in a sleek yet tough body. The included stylus is always appreciated with the only downfall being its mounting mechanism. The Yoga 700 or 900 series notebooks will offer better battery life and marginally lower weight if you absolutely need them. This could easily be counterproductive though, as you would end up paying a pretty penny while sacrificing basic functionality in terms of connectivity options. For what its worth, the Yoga 530 is a sensible laptop for casual and moderate users. It gets a solid recommendation from us for anyone who might be looking for a practical yet classy option that does not break the bank. Unusually large bezel below the display.